Matt and I met through a mutual friend. Neither of us were looking at the time, in fact, we were both almost at our breaking point with the dating scene altogether, but the old cliche is true, you WILL find them when you aren’t looking! I would have talked to more of my guests that I hadn’t seen in awhile and spent more time with those who traveled from further away. I would say, try to enjoy it all! Enjoy the good things and the “whoopsies” because at the end of the night it will feel like it went by so fast! I loved every aspect of my interactions with all of the girls at the shop! After my first visit I knew I didn’t want to shop anywhere else! Trying on dresses of course! My white dress picked me! The way I felt in that dress said it all! 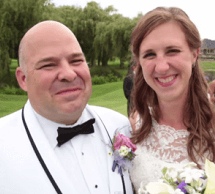 And now, without further ado, the wedding video! Congratulations to Matt and Ashleigh!